Vila Restral gave birth to an abomination of a Retriever. His barge was equipped with a Civilian Armor Repairer--apparently because his 1MN Civilian Afterburner took the slot that would otherwise have been occupied by a Civilian Shield Booster. Vila was contacted by the Agent in charge of killing him. The miner didn't handle himself very well. For someone with so many civilian modules, he was decidedly uncivil. 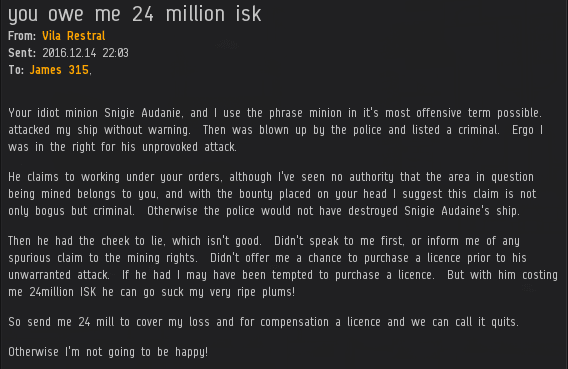 Agent Snigie Audanie urged the miner to be reasonable. Vila chose to throw a temper tantrum instead. Fortunately, Snigie had a back-up plan. Our Agent cautioned the miner that if his poor behavior continued, he would need to call in reinforcements. Vila saw this not as a threat, but an opportunity. Maybe Snigie's superiors would see things his way? Agent Salah ad-Din al-Jawahiri was brought into the convo to lower the temperature. Things were getting out of control. Vila claimed that if he'd been offered a mining permit before the gank, he might have been tempted to purchase one. Similarly, if he hadn't been so rude to my Agents, I might have been tempted to reimburse his loss. Alas, it was not to be. 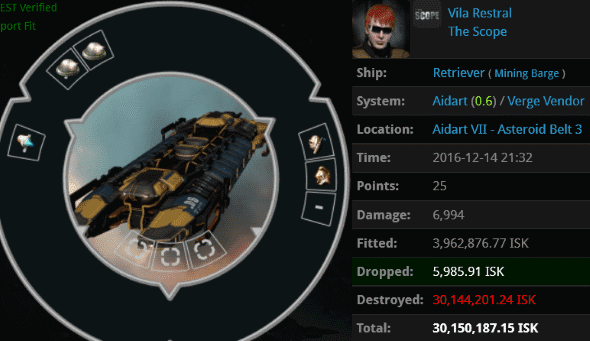 Vila said he wouldn't be happy if he didn't get 24 million isk. But I think we all know that Vila wouldn't be a happy miner anyway--not even if he had all the isk in highsec! For only the Code can make a miner truly happy. "Alas, it was not to be." I sniggered mightily there, and I don't think I can ever face plums-and-custard again. Welcome, triggered anon1226, to the Pandemic Horde anti ganking militia. Your predictable tears show you have the qualities of a true PHag! You certainly post like one. Make sure you see thomas en chastity as soon as possible for your placement in his advanced Highsec Online Moderator and Operator classes. You seem like a natural born H.O.M.O.! The Savior will serve the satire at his leisure. We should take what he gives with grace and composure as he knows what's best, and in what dosage your fragile carebear minds can handle his truths. Hm, Gankr, I like the cut of your jib. Well put! Rob, I always see you posting here, and it always seem to be some stupid idea that the cunts of the Code are right. Hi Anonymous 7:38. It's good to see you back again now that the school holidays are upon us! Please keep minerbumping comments free of profanity salty anonymous miner. To clarify CODE. always wins. You guessed it! You are now an official PHag. I have missed DJ, oft times the only voice of reason. Now you miners need to get a permit, or get rekt. Hey DJ, I hope you're well and prospering! DJ Entropy; Lest We Forget. Decipher the message. It's my in game name and I will give you a billion ISK. Rob, I agree the "Alas, it was not to be" was good; however, I already was laughing after I read "For someone with so many civilian modules..." The Saviour certainly has a brilliant way with words -- no wonder even the anonymous haters keep coming back for more of this outstanding blog. Granted. I guess my loud snigger was just the culmination of all those which had preceded it! Carebears be mad they can't understand the humor, and that they play EVE wrong. Triggered anon 742, welcome to Pandemic Horde anti ganking militia, you gonna fit right in.